Glasgow used to trail its neighbour (and great rival) Edinburgh in the speciality coffee stakes. However, in the last couple of years, Glasgow has been catching up fast through a new breed of coffee shops such as Meadow Road Coffee. Traditionally, speciality coffee in Glasgow has clustered around either the West End or, more recently, the City Centre, but Meadow Road bucks that trend, situated at the far end of the Dumbarton Road, which runs due west from the West End’s southwest corner. Before purists such as myself cry foul, Meadow Road Coffee is indeed on Meadow Road, on the corner where it meets Dumbarton Road, giving the coffee shop windows on both sides. Although north facing, it catches the morning sun and is generally filled with a pleasing, subdued light. A small rectangle, Meadow Road has a simple layout, counter at the back, seating along the windows. A good deal of the interior is given over to a small but impressive kitchen which turns out an equally impressive range of food, vying with the coffee in terms of quality. The latter comes from local roasters, Dear Green Coffee, on both espresso and filter, the latter supplemented by regularly-rotating guests. 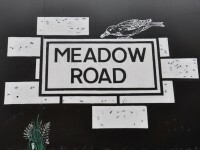 Meadow Road Coffee sits on a corner where the broad Meadow Road meets the even broader Dumbarton Road on its westward march out of Glasgow. About twice as long as it is deep, the long side faces the busy Dumbarton Road, where a pair of benches occupy the pavement. The door is on the left and half-height windows overlook both roads. Inside, the layout’s equally simple. To the right, two window-bars, one for each window, overlook Dumbarton Road, while ahead of you, along the left-hand side, a solitary window-bar overlooks Meadow Road. The only other seating is at the left-hand end of the counter, a couple of stools allowing you to sit and watch shots being pulled on the two-group La Marzocco, which sits behind the counter on the left. Alternatively, right under your nose, there’s the brew-bar. The only drawback of this layout is that, with the exception of the seats at the end of the counter, you’re sitting with your back to the staff and the rest of the customers. On the plus side, everyone gets a view, plenty of light, and the interior is delightfully uncluttered. I can only imagine the clutter and confusion if there were a couple of tables stuck in the middle of the floor! The counter, or more correctly, counters, are the most dominant part of Meadow Road. In effect, it’s a two-for-the-price of one, with the left-hand part housing the coffee and cake, while to the right, a large display cabinet houses most of the food, with the rest being prepared in the open kitchen behind it. There’s a similar division of labour: Sean, the manager and head barista, handles the coffee, while the cheerful Billy looks after the food, and what a team they make. In many coffee shops, one dominates, but in Meadow Road, it’s a true partnership of equals. I should know: I did my best to try most of it! Although I was there on a Monday, I was very much in a brunch mood, so started with the pea and mint frittata, a tasty and filling combination with a generous side salad. I followed this up with a poached egg on toast, although that scant does it justice. This was the perfectly-poached egg, sat atop a mound of salmon, cream cheese and spinach, all supported on some lovely toast. Each element by itself was amazing, and the whole ensemble was awesome. After that, the coffee had something to live up to. Meadow Road has a bespoke espresso blend from Glasgow’s very own Dear Green Coffee, with a single-origin on filter, which is joined every week by a guest. These two filters are matched to either V60 or Aeropress, depending on which Sean thinks brings out the best in the beans. While I was there, the Dear Green was through the Aeropress, but my eye was drawn to the guest, a Kenyan from Lancaster’s J Atkinson & Co.. This turned out to be bright, fruity and dare I say it, a typical Kenyan, except it was that and then some, a real counterpoint to my lunch. Since I’d had two lunches, it was only right to have two coffees, so I followed this with a flat white, which was rich and smooth, the coffee really complimenting the milk. Saturday 09:00 – 17:00 Wifi ?